Nimes, with a population of around 140,000, is located in the Languedoc Roussillon, near the border with Provence. The city's culture is a splendid mixture of the two regions. It is the capital of the Gard department, although is better known for being the capital of denim, a major industry for the town. 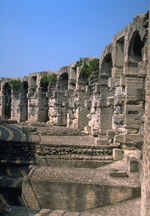 It is also famous for its influence in Roman times, which can be seen by the magnitude of Roman investment in the city. Nimes even beats Rome in its quality of preserved buildings from this era. The arrival of the Romans.. There is to this day much debate over the true history of the city's founding. The first theory is that Augustus settled here in 31BC with veterans of the Egyptian campaign. The evidence for this is the discovery of coins stamped with a chained crocodile. If you look beneath your feet you will find this same image adorning the streets. This is just one example of what the makeover artists have included in the city. The second theory is that Caesar came here in 44BC and founded the city. After the Roman occupation ended, the city was engulfed in a harsh religious dispute when the Visigoths from the North clashed with the resident Catholics. In the 13th Century yet more trouble loomed when the people of Nimes allied with the Cathars who were opposed to the Catholic church and protested about their level of corruption. Simon de Montfort led a crusade against them and the city was forced to surrender. Not content with having a fascinating historical atmosphere, Nimes has decided that it's now time to get up to date by being the most modern city in southern France. A whole legion of celebrated architects and designers were recently brought in to give the town a hi-tech makeover. It is now bidding to be a "city of innovation" and we wish them the best of luck. Modern day Nimes is a wonderful and clean place to explore, and not so big that you can't get around on foot. Wander through the pedestrianised historic city centre and through Nimes' squares and parks. All the amenities that you would expect from a big city are on offer, with shops, restaurants and bars galore. The top historical sites in the city are the Jardin de la Fontaine, Diana's Temple and the Arenes amphitheatre. The latter is now used for the exhilarating, albeit slightly suicidal, sport of bullfighting. It is well worth going down to watch a show. You won't need to worry if it starts raining as its now been fitted with a retractable roof. Although, for a city that receives 300 days of sunshine a year, there hardly seems any point to it. There's a great deal to explore in the surrounding area. Nimes itself is situated between the limestone hills and the plains of Petite Camargue. Surrounding this you'll find the fabulous Rhone Valley with its many vineyards planted around gentle hills and smaller settlements. 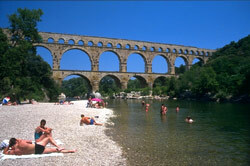 Twenty minutes away you'll find the Pont du Gard aqueduct, which is still an impressive feat of construction today. During the summer months, the temperature gets very hot - so be prepared. If you don't like the crowds or are maybe just morally at odds with the practice of bull fighting then don't come during Pentecost. At this time of year the city gets swamped for their annual festivities. It's worth noting that accommodation, like everything else, gets packed out then. Nimes has its own airport, which has regular UK flights with Ryanair. Alternatively Montpellier and Marseille are both within reach, Montpellier being served by GB Airways and Ryanair, and Marseille being served by British Airways, easyJet, Ryanair and Aer Lingus. If you prefer travelling by train, then take the fast (approximately three hours) and comfortable TGV train service down across the country after hopping off the Eurostar at Paris. And if driving is your thing, Nimes can be found on the A9 auto route. Joanna, I thoroughly enjoyed your article "Best things about living in France - Top 10". My 22 year old daughter spent her spring semester of her junior year of college in Paris and absolutely fell in love with the country, much like you did. She was able to secure a teaching position, teaching English to French students, at a school in Nimes, France for October 2010 through June 2011. I would be so grateful if you might give us some advice as to how she might find safe, affordable housing in Nimes. Her salary is very modest, so we must be frugal. Any assistance you might provide, including references to others who might also assist us, would be greatly appreciated. I'm afraid I can't really talk about Nimes, as I have been but I don't really know the place. However in Carcassonne there are people who rent rooms in a house, aimed at students, quite cheaply, but although I am sure this will also apply to Nimes I have no idea how to find them, apart from local papers and asking locally! Almost all schools... from college level up, round here also have boarders, maybe there will be some sort of possibility of staff accommodation if your daughter asks the school she will be teaching at? Unless it is a private language school, in which case I would suggest asking them if there are any "host" families for temporary staff... also a good way of learning French. Failing that, maybe there could be a long term agreement at a lower rate with a B&B or gite? Apartments round here tend to be around 400 Euros a month for the cheapest studio... but as the summer season is not involved there may be deals to be had. Look at ads for small apartments in the area and contact the owners to see if you can strike a deal from Oct to June? Most gites are only busy July and August. Another idea, static caravan sites may be open all year, not all are but some are, and finally if there are other foreign teachers coming in to the school on a similar basis, perhaps a share of some sort can be arranged? Do you know Nimes better than we do? Do you have photos of Nimes? In the south east of the Gard department, in the Languedoc-Roussillon. Access: The town has both an airport and a TGV station. Economy: The town's largest industry concerns the production of denim. Interesting fact: The word 'denim' comes from 'Du Nimes, which means 'From Nimes'.